The list of accolades for Miller Union (MU) continues to grow. Named as one of the top restaurants in the country by Food and Wine and one of the 10 best new restaurants in the country by Bon Appetit, chef Steven Satterfield, co-owner Neil McCarthy, and bar manager Cara Laudino have created a great team at MU. Chef Satterfield has made numerous national appearances, including a recent segment on Martha Stewart’s show. Dinner Party Download called upon Laudino last year for an overnight creation to be featured on their site and podcast (see “The Pemberton”) and Imbibe magazine just published a spread on Atlanta cocktail hotspots featuring her and the rest of the Miller Union staff. 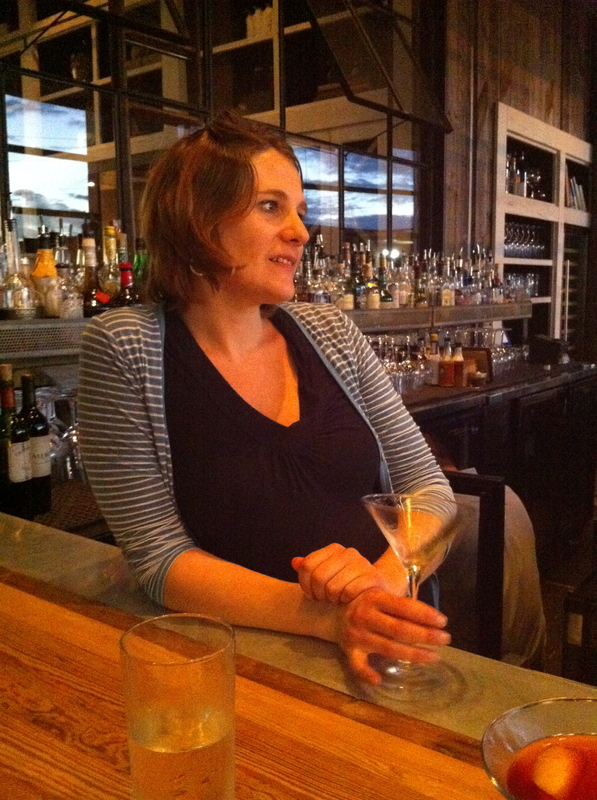 As a brief background, Cara started off tending bar two nights a week at Sotto Sotto. “Evidently Neil (McCarthy, co-owner of MU) saw something good in my two nights a week behind the bar,” laughs Cara, so she was soon hired to manage the bar at MU. Her background in wine and cooking definitely adds to her skill behind the bar and is on evident display in her use of herbs and flavors in the numerous infused simple syrups and grenadines she keeps in various containers at the end of the bar. 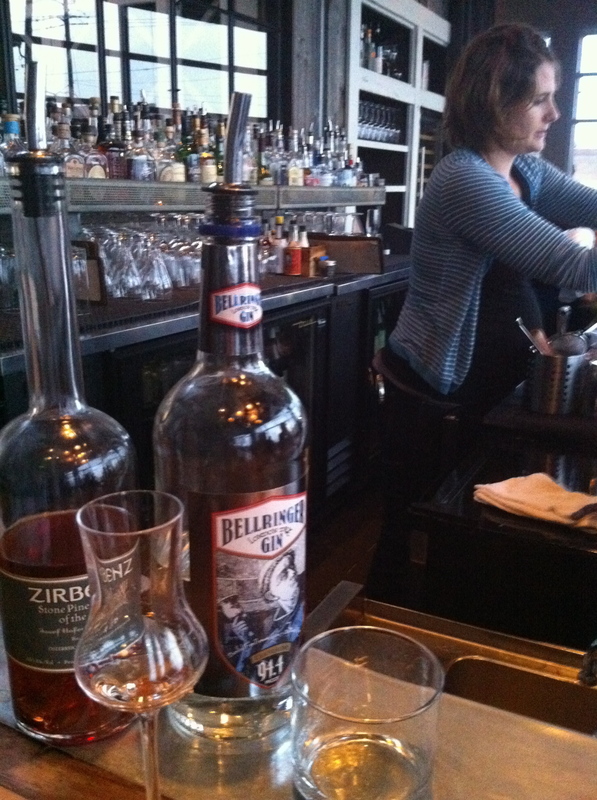 “I don’t do a lot of infused alcohols, but spend more time with syrups,” Cara states. 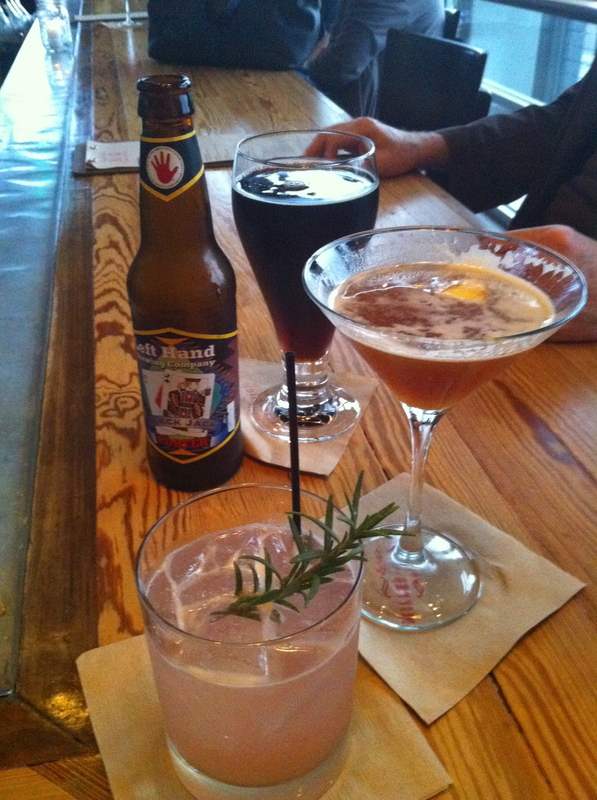 Perfect examples of the se flavor marriages can be found in MU’s signature drink “Miller Thyme,” which uses a thyme syrup and the “Black Rose,” which features a hibiscus grenadine. How do you approach a new drink? It depends. For example the Artichoke Spaceship. I had the name of the drink long before I had the actual drink. I found this awesome commercial on YouTube for Cynar (see video). There are these Italian men sitting in the middle of this traffic circle and they were all happy and they are drinking Cynar. Traffic keeps moving pass them. Then they turn up the bottle and they look at each other in panic, and traffic stops. Then they pull this lever you haven’t seen before and an artichoke swirls up around them and they blast off in it. It’s absurd. So with that drink I had the name in mind and I played around with it using Cynar. A lot of my drinks I will take a classic recipe and work with that. I think that’s a really good way to start, with something that is tried and true, like a sour or a Manhattan, then play around with it. What are you looking for in a drink when you mix and create? Mostly you are looking for a balance; balancing bitter and sweet. My philosophy on cocktails is to get back to “simple” and to emphasize the goal of the ingredients. Really keep it simple. I do a lot of tasting and spitting these days. But it is a lot of collaboration with the other bartenders and friends. Speaking of collaboration, how closely do you work with Steven (Satterfied) on recipes, drink ideas? We collaborate a lot. For instance “The Evergreen” we worked on together a lot. We sit down and talk about what is available, what ingredients are in season, and then use that as a starting point. We think about fall flavors and make a creative map. Nicky, The Piper, and I all encourage you to make a trip over to the Westside and check out the nicest bar wench in town. 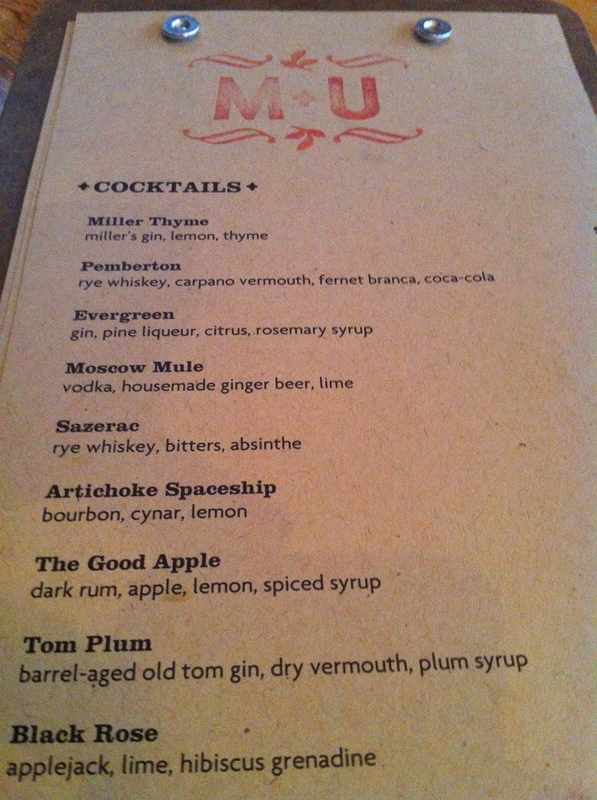 Try a “Pemberton” or a “Miller Thyme,” or just let Cara surprise you with a creation. You won’t be disappointed. Next Next post: Celebrate your freedom to imbibe today!